DC's light-hearted Shazam! dropped 53% in its second weekend for $25M and $94.9M domestic. Looking more broadly, the superhero film has made $221M worldwide. Those aren't gigantic numbers and some out there are trying to paint this as a disappointment, but that's simply not true. First of all, nobody thought it would do Wonder Woman or Aquaman numbers, that's just crazy. Most importantly, Warner Bros. only ponied up $90M for it and continue their streak of successful DC Comics movies, both critically and financially. The good will this creates among moviegoers will lead to confidence further down the line. The reverse-Big comedy Little, starring Regina Hall, Issa Rae, and Black-ish star Marsai Martin opened with a solid $15.4M. Martin is getting a ton of praise for her performance as a younger version of Hall's character, a bossy, mean-spirited exec who is magically transformed into a 13-year-old girl, although the reviews have been mixed overall. Count this as another modest hit for super-producer Will Packer, who is the guy behind most of Kevin Hart's hit comedies. He may have found a new star in Martin. The apocalypse came early for Hellboy, Lionsgate's reboot of the popular comic book character with Stranger Things star David Harbour as the big red demon. I don't know what they were hoping for out of Neil Marshall's grim, R-rated film but they couldn't have expected much and that's exactly what they got. The reviews have been harsh, with many noting that they wish Guillermo Del Toro and Ron Perlman were allowed to complete their trilogy like fans wanted. But Lionsgate wanted a less-costly production, Del Toro wasn't down for that, so complete relaunch was decided on. 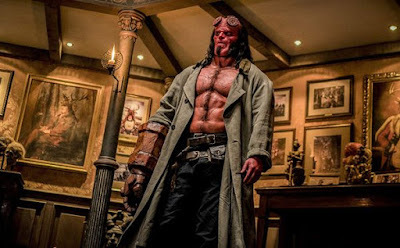 I don't know if Del Toro would've turned a third Hellboy into a blockbuster hit. It's hard to say. Granted, he wasn't an Oscar-winning director when his 2004 film earned $99M and the 2008 sequel made $160M, but I guarantee he would've done better than $12M. The teen romance After opened with $6.2M, which sounds bad but I doubt Aviron put too much into this one. The Jenny Gage-directed film is based on the popular Anna Todd novel that began life as Harry Styles fan-fic....seriously, but before you scoff remember 50 Shades of Grey began as Twilight fan-fic. Apparently that's how these things work? Anyway, the film stars Josephine Langford, the sister of 13 Reasons Why star Katherine Langford, and Hero Fiennes Tiffin. And it's a disastrous start for Laika's Missing Link, the animated stop-motion film with the voices of Hugh Jackman, Zoe Saldana, and Zach Galifianakis. My worry was that this would happen, because something about the story of an explorer helping a sasquatch find his way home didn't seem to be clicking. The film opened with $5.8M which is roughly half of what Kubo and the Two Strings opened with three years ago. Despite critical reviews for virtually all of Laika's movies they have never come close to earning what tradtionally-animated movies have made. I also think this does not bode well for Laika's distribution partnership with Annapurna, after spending years with Focus Features.